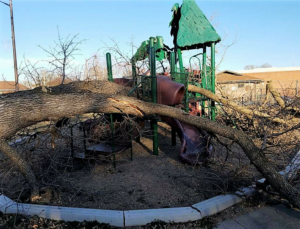 After a tornado destroyed this community playground, a grant from the Hansen Foundation was used to help repair the play structure. Volunteers went through the tedious process of evaluating every piece that was damaged, identifying the part number, and reordering the parts. Then the playground was repaired piece by piece. The mini park is now offering a great place to play and exercise again for children.